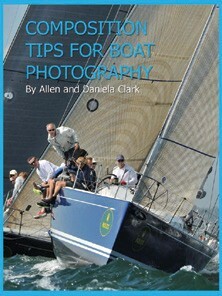 Professional marine photographers Daniela & Allen Clark have been WindCheck contributors for nearly a decade. Their superb photographs appear in every issue of this magazine, and frequently on the cover. Their company, PhotoBoat, also provides images for the Storm Trysail Club’s Block Island Race Week News, which the WindCheck crew produces in odd-numbered years. Daniela & Allen are among the hardest-working and most talented of our contributors and also some of the nicest, and it’s no surprise that they’ve launched a series of instructional eBooks to help other sailors take better photos. The first of these manuals, Composition Tips, covers the fundaments of successful sailing photography including keeping your horizon level, framing your subject with the rule of thirds, shooting from different angles, and editing your images. There’s also a “Shot Busters” section comprising tips on avoiding things that can ruin a shot, and every page is illustrated with examples of both good and not-so-good photos. Daniela & Allen, who started PhotoBoat in 2005, met when they were instructors at Longshore Sailing School in Westport, CT. They’ve logged more than 4,000 hours on the water and countless more in the editing room. Composition Tips for Boat Photography is an excellent resource for aspiring photographers. It’s available at PhotoBoat.com, where you’ll also find opportunities including Daniela & Allen’s photography seminars at yacht clubs, on-the-water sessions, portfolio reviews and marketing for other photographers, as well as numerous regatta galleries and information about hiring PhotoBoat for regattas and commercial or editorial projects.